American Terror: Got a Great Part! I am so excited! On Tuesday, I got a last-minute call for an audition for a TV series (on AMC, called American Terror), and I got the part!!! I’m playing a kid named Michael, and Shane Shuma plays Michael’s best friend Jimmy. I really liked Shane, and I hope we get to work together again. He’s very talented, and very nice, too. We had a lot of fun. Kameron Badgers and Shane Shuma filmed a “sizzler” for AMS Pictures, with director Katie Dunn and Director of Photography Taylor Witt. Make-up artist Tomi Hutton created realistic gory props for the shoot. The story is based on what happened in Wisconsin in 1957 when two kids playing in the woods accidentally get a look inside their spooky neighbor’s workshop. The neighbor, Ed Gein, was a real serial killer who was the model for the character Buffalo Bill in the movie Silence of the Lambs. Nobody believes the boys when they tell what they saw. Nobody except Ed Gein, that is. We filmed a “sizzler” today. Basically, that’s like a miniature pilot for an episode for the series. If the producer likes the sizzler, they’ll order the whole episode, and we’ll go back and finish it. 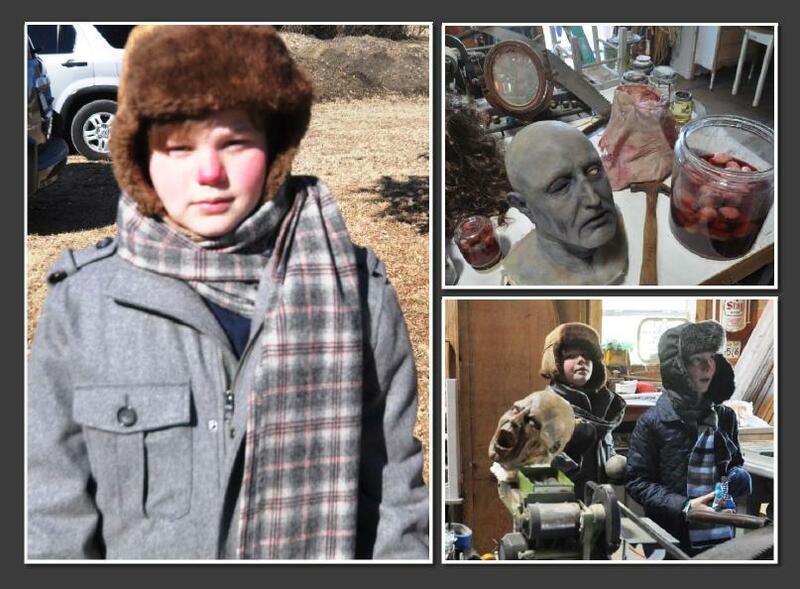 The last part we filmed today is what happens the day after Jimmy and Michael get a look at the workshop and tell Jimmy’s mom what they saw — the kids are playing outside when they see Ed Gein walking down the road with a wheelbarrow, and realize that he knows that they saw what was inside his workshop. It was so cool! The director, Katie Dunn, and her crew were super nice. Sadie McGoodwin played our mom, and Tom Young played Ed Gein, the bad guy. He’s pretty nice, though — I’ve worked with him before. One of the production assistants, Gabbi Jewell, played a dead woman. The make-up artist Tomi Hutton created all these really creepy looking props — arms and legs that were dripping blood, intestines floating in a jar, a lampshade made out of “human” skin, shrunken heads, and all kinds of other stuff. It was all in a workshop, and made to look as if that’s where the boogeyman cut up his victims. I’m glad I didn’t see a real dead body — the fake ones were creepy enough! I had to get a haircut, because kids in the 1950’s had short hair, but it’s not too short. This was a great job. 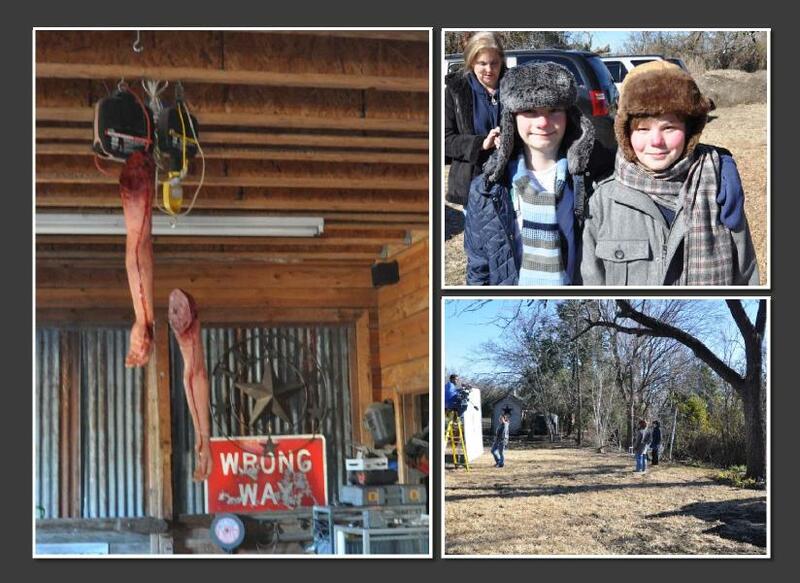 We filmed at the Witt residence in Prosper Texas — that’s a big farm, owned by the director of photography and his family. Taylor Witt is his name, and he’s built a bunch of buildings on the property that look like different kinds of houses or workshops or just good backdrops for film shoots. So the company he works for — AMS Pictures — films a lot of things there. Some of the actors had been there before, but my grandma got lost driving up there –Prosper, Texas is way north of Dallas. We made it on time, though. That’s good. I wouldn’t want to be late. Actors who show up late don’t get called back, and I’d like to work for this production company again. They were really nice, and every scene was planned out so we started and finished right on time. I hope the producer likes our “sizzler”, and we get to make the whole episode instead of just part of it. I’d love to be on a network TV show. Do you think I look like a kid from 1957? My nose and cheeks are red because we’re supposed to be outdoors in Wisconsin in the winder. The hat belongs to my grandpa, and the jacket belongs to my cousin Zach.